We've had a temporary Headteacher for the last year. He came out of retirement to step in until a new permanent head could be found. He's amazing, a breath of fresh air to a school that had become sad and tired around the edges. He arrived bursting with ideas, passion and experience. He won the children over and he won the parents over too. The school was smitten. He introduced good behaviour awards, ditched the old 'non competitive' routine, pushed the children to excel, to reach high, to aim high. He made the school a really happy place. 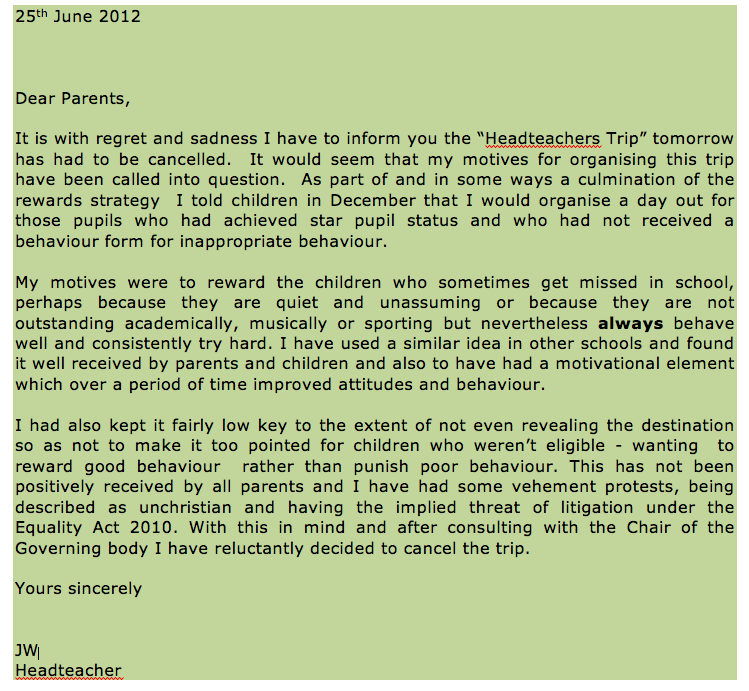 One of the things he had promised come the end of the school year was a special 'Headteachers Trip'. The culmination of the year long reward strategy where children who had achieved 'Star Pupil' status and not received an inappropriate behaviour form would be treated to a day out. The children were excited, the parents were impressed. They knuckled down and worked hard to achieve team points and class stars in order to become a 'Star Pupil'. One by one they took their place at the front of assembly to collected their coveted Star. As good behaviour and hard work is rewarded, so inappropriate behaviour results in a dreaded pink slip and to secure a place on the 'Headteachers Trip, you needed to be a pink slip free zone. Sonny and Betty managed it and Biba accepts that she deserved her 3 pink slips for chattering when she should have been working (not sure where she gets that from). Today was supposed to be trip day but Betty arrived home from school last night with the below letter in her hand and tears in her eyes. Reading it took my breath away. Can you believe that someone would stoop as low as this? Are they in denial about their child's behaviour? What kind of example are they setting by kicking off in this way and threatening legal action? It beggars belief. Key Stage 2 parents are up in arms. Not only at the way this parent has behaved but also because they don't have the guts to come forward and explain their motives. And our 'Star Pupils' are left questioning why they worked so hard all year when they have effectively been punished. You will see from the comments that this has been accused of being a witch hunt. This is not the case and I would like to offer the parents involved the opportunity to tell their side of the situation by commenting below. You don't need to be registered to do so and you can remain anonymous if you wish. Everyone knows that I hate camping. 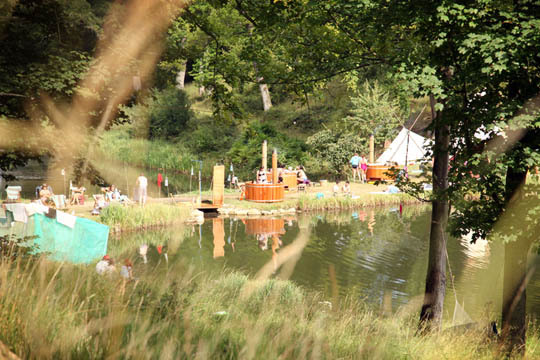 Never liked it as a child and it certainly wouldn't normally make my list of things to do this summer but that was until I came across the Wilderness Festival. Taking place from 10th - 12th of August at the beautiful Cornbury Park in Oxfordshire, Wilderness is the ultimate family festival packed full of workshops, music, comedy, dance and activities interspersed with walks into the wild, enchanted woodland trails. The line up is HUGE and I'm really excited to see that the Future Cinema will be staging the first ever full festival takeover for the grand finale of their amazing Bugsy Malone. I've seen it twice already and I cannot wait to be part of it again. Embracing the Wilderness spirit, the ‘Little Wild Ones’ area will be a hive of inspired children’s activity. 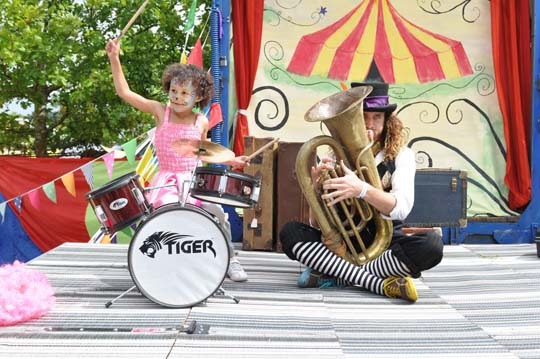 The Flying Seagull Project will be there with a range of entertainment based in a beautiful gypsy-esque, open-sided, pavilion tent complete with vintage horsebox and Willy Wonka style stage. Your little ones can discover the magic of nature with a rainbow trail led by the Fairyland Trust as the whole family embarks on a fascinating journey around a wonderland of fairy folklore and natural history. The Bearded Kittens will once again host the famous ‘Not Your Average’ cricket match on the lawn, complete with lashings of Pimms and piles of cucumber sandwiches. And the Roald Dahl Museum and Story Centre will take the entire audience on a trip to the author’s mythical world with poems from ‘Revolting Rhymes’ and ‘Dirty Beasts’. 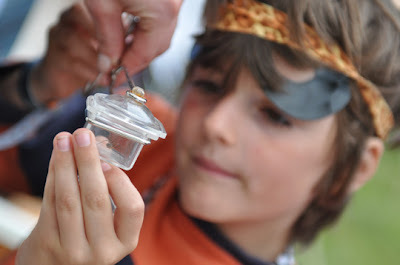 For parents, something not to be missed is the fabulous Bushcraft Company. They will be delivering outdoor adventures influenced by nature, where your children can learn a whole range of bushcraft skills from lighting fires to woodland games, shelter building and carving techniques. Whilst the children are channeling their inner Bear Grills you get to chillax or go for it big time at one of the late night parties. 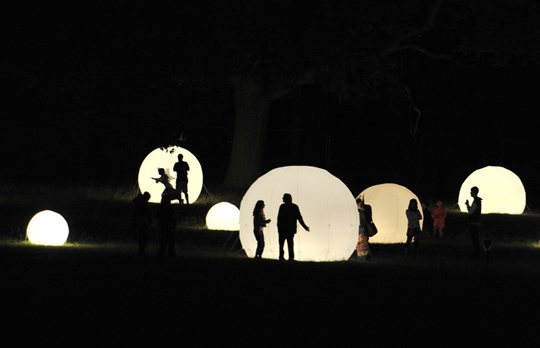 Well I have a full festival family ticket* for 2 adults and 2 children worth £260 to give away. Simply enter using the Rafflecopter widget below (please note that the widget doesn't always work on a mobile device). Boutique camping is available (phew). *Family ticket does not include accommodation... you will need to bring your own tent! UPDATE: Congrats Claire Walsh, you win the family pass! I've been back from Niger for a couple of weeks now and I've been blown away by the support for #ShareNiger from my fellow bloggers and the national media. One lady in particular, Merry from Patch of Puddles has made it her personal mission to help some of the children of Niger and I'm asking you to help too. We are asking you to donate £1 to our World Vision sponsor a child appeal. £1 that you probably won't miss but will change the life of a child in Niger. 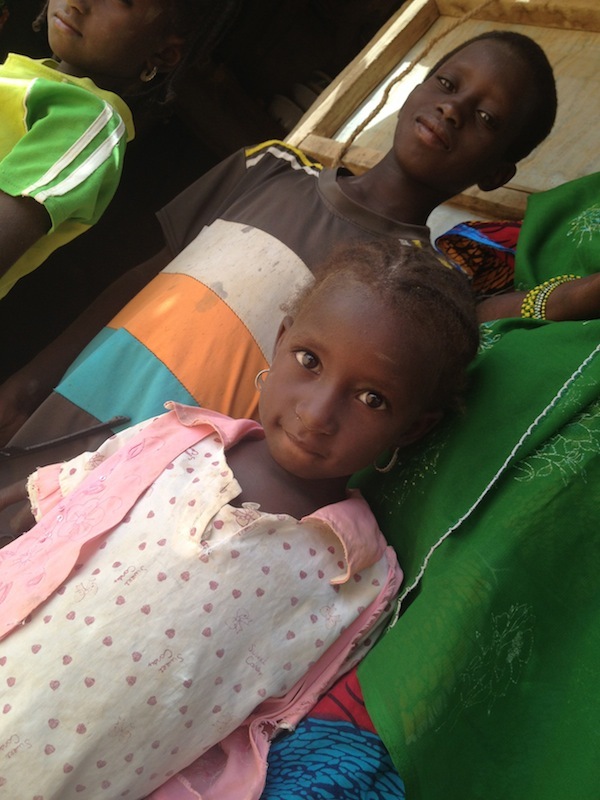 Please read Merry's post for information on how you can donate and you will be included in all updates from the child / children that we help out in Niger. World Vision believe the best way to change a child's life is to change the world in which they live. And the best way to change their world is to help their community to become self-sustaining. This is what World Vision Child Sponsorship does. By sponsoring a child you will help to bring about long-term benefits to the child, their family and community. Child sponsorship funds are used with the co-operation and direction of the community to benefit vulnerable children, families and community members, including sponsored children. This work ensures that the community will be able to provide the children with the basics they need, which helps them to grow up in a healthy environment and have the chance for a better future. Child sponsorship enables you to make a positive and real difference to the life of the child you sponsor within their family and community, and gain an insight into the reality of life in developing countries. Don't think that saving these children is someone else's problem because it isn't. Content and Calm have a great new competition for budding little travel reporters so if your little one loves spending time in front of the camera read on as they could be in with the chance of winning a luxury family holiday to Greece or an all expenses paid trip to a top UK family attraction. Content and Calm are looking for 10 TravelBug Reporters who will be sent off on an all-expenses paid adventure with their families to report back and share their insider tips for a series of Content and Calm online travel guide videos. All you need to do to enter is create a short fun video of your child sharing their favourite holiday memories, highlights and funny stories. To help you along Content and Calm have come up with 6 questions that you can use as prompts but feel free to be as creative and out of the box as you wish. You could even create a location set or dress up in your favourite holiday clothes! 1. Tell us about your favourite holiday, where you went and what you did? 2. What was the best element of the holiday and why? 3. What was the worst part of the holiday? 4. If your best friend went there tomorrow, what would you tell them to do? 5. Who would you most love to go on holiday with? 6. Who is more fun on holiday, mum or dad and why? To help you with inspiration here's Biba's Travel Bug report on a holiday to Phuket in Thailand. 3. Get your friends and family voting! 4. If you blog, why not blog about the comp too. It's a great way to get people voting. The 19 videos with the most votes and 1 random wildcard entry will then go through to the judging round where the 10 Content and Calm TravelBug Reporters will be chosen. Good luck and look out for other entries by following the #ContentandCalm tag on Twitter. *Disclosure* This is a sponsored post. I'm simply on film and upload duty! I've had a roller coaster of a few weeks, Cybher followed by my amazing trip to Niger and then a week of sickness and media interviews. After such emotion it's hard to get your head around regular blogging again. It was the same when I came back from Bangladesh. I have a list of posts to write but my words are feeling a bit insignificant for the time being. Then a couple of days ago the girls dance teacher gave me a DVD to watch. A DVD of a dance rehearsal from 25 years ago featuring a group of us practicing a tongue in cheek number for a school fundraiser. Old friends..... enjoy, this is the Mundella crew in full effect. New friends... I am the tall one in the black pants and white top! If you're looking for a contemporary dance class in Leicester take a look at Bloom Dance. Bloom runs an adult class on a Monday morning in Kibworth and children's classes on a Thursday after school in Great Glen.